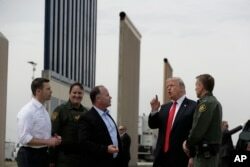 FILE - President Donald Trump reviews border wall prototypes, March 13, 2018, in San Diego. 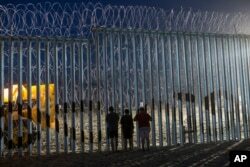 FILE - Children observe the movements of the U.S. Border Patrol agents from the Mexican side where the border meets the Pacific Ocean, in Tijuana, Mexico, Nov. 16, 2018. อีกความหมายหนึ่ง wildcard หมายถึงปัจจัยที่เหนือความคาดหมาย หรือคาดเดายาก ยกตัวอย่างเช่น He’s a wildcard. Don’t count on his support. 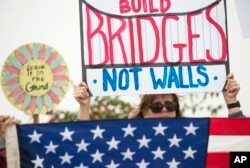 FILE - A protester holds up a sign during a rally against a scheduled visit by President Donald Trump, in San Diego, California, March 13, 2018.